The colors are absolutely beautiful! It is wide enough & long enough to fit nicely on my King sized bed. It is good quality fabric. I’m not sure how it will wash up. The batting inside could bunch up. So I will avoid washing it. I’m very pleased with it. 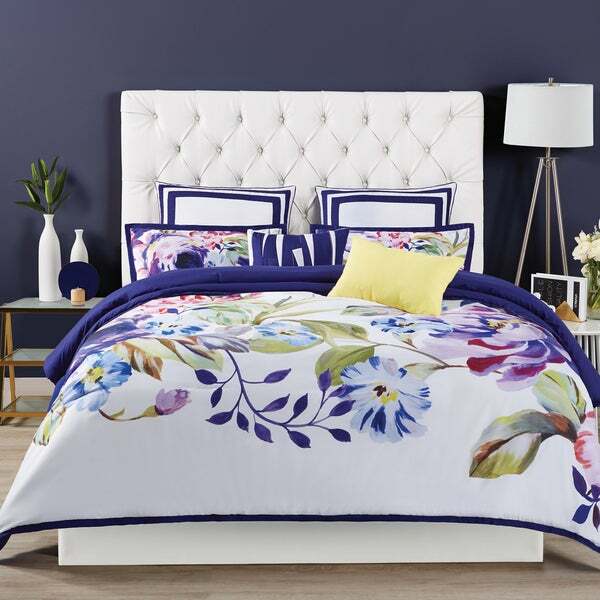 Add a pop of color to your bedroom with the Christian Siriano Garden Bloom 3-piece Comforter Set. This set features a soft polyester microfiber construction with a floral pattern in white and purple that you will be sure to love. I just ordered this comforter so I cannot comment on it specifically. I can say that dealing with customer service was beyond excellent. This comforter is one of the few with bigger dimensions and it is hard to find any comforter that is bigger than 90x90! It is also a comfort in that I am a huge fan of Christian Siriano fashions as they are beautiful made. I rate it a 5 because of the designer. Hope I am not disappointed! Love my garden bloom 3 piece comforter set. Love the vivid colors that accent my bedroom walls. My 21 month old granddaughter went to my bedroom, put her hand on the comforter and said, "Nice" She loved it as well as me. This comforter set is gorgeous. I JUST RECEIVED MY KING SIZE CHRISTIAN SIRIANO BED COMFORTER SET! IT IS SIMPLY BEAUTIFUL AND FINE QUALITY! I LOVE THE VIBRANT MULTICOLOR FLORAL DESIGN THAT ENHANCES THE DECOR IN MY MASTER BEDROOM. I MADE THE BEST CHOICE THE MATERIAL IS SOFT & FEELS LIGHT LIKE COTTON. THANKS CHRISTIAN SIRIANO FOR SUCH A WONDERFUL RICH & CLASS A DESIGN! I have to rate this FIVE STARS! I love the design and colors in this comforter set. I am anxious to use it once I finish redecorating my bedroom. This will definitely brighten the room and add color to a dark room. I was happy this was restocked. This comforter set is so pretty.. I love the colors and the materials is very nice.. This is one of my favorite sets and I have bought many from overstock.. Excited to received the item promptly. When I opened the package and spread the comforter out I was very disappointed that the pattern in the fabric was in no way like the pictured image. it seemed to have been cut differently, with one side of the comforter being predominantly white and the design of huge flowers on the other, also the colors were not as clear and vibrant as I expected. This was a shock to me as I have never experienced such as disappointment with any of my orders to Overstock. I understand that not everyone can be pleased all the time, but I have been spoiled by the consistent quality and accuracy of product descriptions at Overstock. For the first time I had to return a product. That said, I must now compliment the company on their customer service. Immediately (on 6/7/17) I called and was treated in a friendly and professional manner. Within ten minutes of the phone call, I had the return label in my email. I took to box to the UPS store the following Monday. I received notification of a credit to my account on 6/14/17. That, by anyone's standards, is great customer service!!!!!! I had given 2 stars for the item, but then added one for the customer service.. Really, it is worth more, but I am still unreasonably disappointed...... I really wanted the comforter I thought I was getting. I just received my comforter. Haven't gotten the chance yet to put it on my bed but I have to say, the quality and the softness is beyond just being "good".... its excellent! The colors are vibrant and just gorgeous. I need to order new valances and curtains but the colors are so great, I'm having such a problem to decide what color I want. I could get navy, blue, lime green, yellow or purple. I really recommend this comforter. Love, love, love this set. THe only problem I've had is trying to find sheets to match the blue/purple color used in the border trim on both the shams and the comforter. It is difficult to find so I may have to go with another companion color instead. The fabric on this comforter feels awesome! Absolutely beautiful! The picture doesn't do this set justice. I love it! This is a wonderful purchase, colors are fabulous an it is so soft. It is large to cover the bed. Just perfect for spring and summer. I gave it as a gift and my friend is crazy about it. Very happy with this purchase. Adds lovely colors to my bedroom. Would definitely recommend. I love this comforter. It is very beautiful! It’s beautiful!! I like how it reminds me of spring days. "What’s the difference between comforter set and duvet cover set?" The duvet cover you will need to insert a down comforter inside.I hope it helps. "when will the queen size be restocked? " "Is the full/queen size large enough for a queen size bed, or should I order the king size?" Believe I will like the colors... looks very rich.. very pretty. The vibrant multi colors. Caught my attention because of the design and colors. I was originally looking at purples but this looks like a beautiful set.